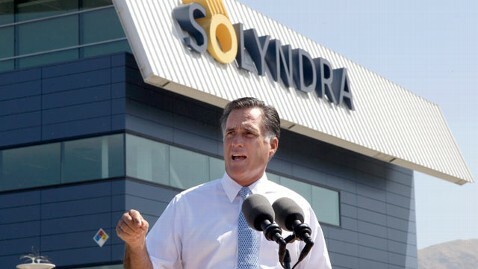 The whole “Solyndra Scandal” has bothered me from the beginning, but not for the reasons you probably think. What annoys me is the amount of hypocritical political finger pointing that the GOP has been doing as a result of the bankruptcy. The Department of Energy loan program was intended to provide capital in high risk/high reward areas and it has done that. With any investment, there is risk of loss, but you have to look at the entire portfolio of investments to really understand the failure or success of something. I should also point out that the loan to Solyndra was started and supported by then President George W. Bush and enacted by President Barrack Obama as it had moved through the system. I had moved on from this issue and put it off as a stain. Then last week’s stunt happened. GOP Presidential Candidate Mitt Romney made a speech on 5/31/2012 in front of Solyndra’s now closed headquarters about how President Barrack Obama made these loans with tax payer money and how bad that is. If you follow Romney’s advice and look at his record as Governor of Massachusetts, you will see scarily familiar actions to what he is now criticizing as President Obama’s lack of understanding of how business works. As reported on the Rachel Maddow Blog today, Romney is not in any position to point fingers about tax payer money being provided to now bankrupt solar companies. Mitt Romney awarded a $1.5 million state grant to solar panel manufacturer Konarka Technologies shortly after taking office in 2003. Konarka Technologies filed for Chapter 7 bankruptcy and laid off 85 workers. If that wasn’t enough he also awarded $4.5 million (18% of the $25 million investment program) in loans to two firms run by his campaign donors. And if that is not enough, the Romney administration provided millions of dollars to now bankrupt Evergreen Solar while he was governor. I also think the numbers provide some perspective too. Solyndra’s loan was $535 million of $37 billion of stimulus funding distributed by the Department of Energy or just 1.4% of the total program. The Konarka Technologies grant was $1.5 million of a $9 million program or 17% of that program. Read more on this topic in my post The Real Reason Solyndra & Evergreen Solar Failed and at the Rachel Maddow Blog & Mother Jones.